Discussion in '1940' started by alanwhytock, Jun 10, 2014. My father was in 263 Field Coy RE 12 Div as a Sapper. He travelled from Gravesend to Cherbourg on SS Vienna on 18 April 1940 and returned to Newcastle on 7 June. If anyone can tell me what this bunch were doing during that time I would be most grateful. He then went on through Egypt, Syria, Palestine, El Alamein, Sicily and 2 battles at Monte Cassino. Luckily he made it back to the UK. I have the units war diary and sadly there are no entries for May, just April. A long shot would be to look at the units diary either side of this one to see if there is any mention on them in France. Sometimes and officer from the unit can make a report several months later and it would get filed in the current diary at the time of writing. It's a long shot but may be worth checking. Many thanks Andy. Are there any entries for June ? The unit left Cherbourg on the 7th, a few days before the mass exodus when the Germans were almost in the town. This is the other diary available at the National Archives. I don't have this one but looking at the dates listed May, June, July, August, October and December are missing. If anything is inside the diary that covers anything to do with the unit in France I don't know. I'd say it's unlikely given so many months are missing after the unit returned to the UK but like I tell everyone - You never know for sure until you look. WO 166/3732 ROYAL ENGINEERS: COMPANIES: 263 Field Company. 1939 Sept.-1940 Mar., Sept., Nov., 1941 Jan.-Dec.
Hello Alan. My father was also a sapper in the 263 Field Co. Also at Gravesend and went to France in March 1940 as part of the BEF. Was at Alizay (nr Rouen) building nissan huts for troops, before being sent with the 7th Royal Sussex to Amiens where their train was bombed in the yards on 18th May 1940. Gethen was the commanding officer. Also evacuated via Cherbourg (17th June 1940) in Operation Ariel, and then sent from Southampton to Newcastle and thence to Bardon Mills. They had a jackdaw as a mascot. I think the 263 was disbanded and he went with another unit on the "Orontes to Cape Town. Also was in Egypt and Palestine and in the Waterless Desert. My father was sent to Germany ( British army of occupation) after the war ended. Any other info we can share ? Some of the men from the 263 and 265 Field Companies Royal Engineers. Most (if not all) were put on the train to make up numbers with the 7th Royal Sussex 18 May 1940 to halt the German advance. Bohler, Frederick George James, 1889423 Driver 265 Field Park Coy RE Died 18.05.1940. Buried at Abbeville Community Cemetary Extension. Dyer, Thomas Stephen 2090927 Sapper 263 Field Coy RE Died 18.05.1940 age 20 . Buried at Marissel French National Cemetary (nr Beavais Rue d'Amiens), Grave 214. Son of William and Minnie Dyer of Brighton, Susssex. Interesting you mention the unit having a Jackdaw as a Mascot. 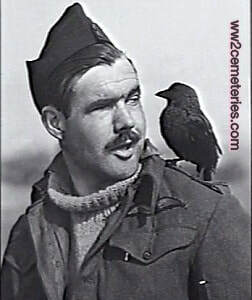 There's an image online at the Imperial War Museum with what's described as a 'crow' on a soldiers shoulder whilst waiting to be evacuated on the West Coast of France in June 1940. Hi Drew. Thanks for your comment. I don't know if the jackdaw was an official mascot or just one that the surviving men temporarily adopted at Bardon Mills. (Jackdaws being intelligent and sociable creatures ). But I'd be interested to look at the picture you referred to on the IWM website if you have a reference for it. I don't have a reference...I just remember posting it on my 1940 Facebook page around a year ago.